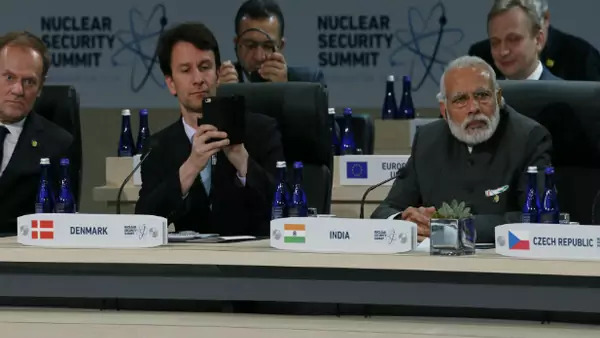 A member of Denmark's delegation (C) takes a picture with his phone while seated next to India's Prime Minister Narenda Modi (...t the start of the second plenary session of the Nuclear Security Summit in Washington April 1, 2016 (Jonathan Ernst/Reuters). Last week the forty-eight “participating governments” of the Nuclear Suppliers Group (NSG) met in a plenary session in Seoul. Among the subjects of discussion: how to consider for membership countries that have not signed the Nuclear Non-Proliferation Treaty (NPT). Discussion of membership for non-NPT signatories was the result of India’s application for membership, an application the United States has vocally supported. Pakistan decided to apply for membership as well, despite its past with the A.Q. Khan network. China pressed for NPT adherence as a requirement for entry. India’s status as a non-NPT signatory meant that this application was never going to be easy. The NSG had discussions on the issue of “Technical, Legal and Political Aspects of the Participation of non-NPT States in the NSG” and decided to continue its discussion. Since the plenary produced no outcome on the question of India’s membership other than a deferral, Indian public debate has begun over matters like whether it was a good idea to pursue membership in the first place; whether the diplomatic strategy was appropriate; and even whether Prime Minister Narendra Modi’s visible push for support around the world cast India in the proper light. People have also focused on the Seoul outcome as a “failure.” My own view, which appears in today’s Indian Express, is that India has done the right thing to be out there trying, that it has the support of forty-plus NSG members which is a significant accomplishment, and that it should keep trying. Read the entire opinion piece here.